A red seal ship is built for “blue water” sailing, making it hardier than most trade vessels, which are restricted to coastal routes. It can carry large cargoes, travel long distances and therefore has more opportunities for profitable trading. Unfortunately, this also makes it a tempting target for others, such as the wako pirates. A red seal ship’s structural strength improves its chances of survival in such an attack, but it is still vulnerable. 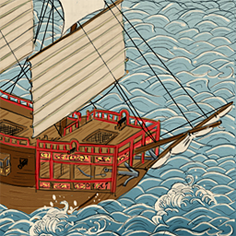 A ship in possession of a red-sealed patent was sanctioned by the Shogun himself, and allowed it to trade freely. The red seal permit system originated toward the end of the 16th century under Toyotomi Hideyoshi. It was an effort to combat Japanese piracy and also control foreign trade by sanctioning merchants and where they traded. Those chosen by Toyotomi Hideyoshi could travel overseas and were regarded as official ships under his personal protection. This not only warned off pirates, but also made it clear to foreigners that it was diplomatic to look after merchants! Very vulnerable in combat if boarded.